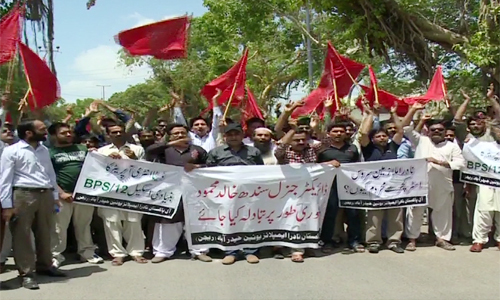 KARACHI (92 News) – National Database and Registration Authority (NADRA) Employees Union staged a protest demonstration to press for their demands in front of Regional Headquarters on Thursday. NADRA employees from across Sindh took part in the protest. They demanded that their forced transfers and bosses’ rude behavior had become a routine matter and it should be stopped immediately. The NADRA employees said they had informed the high-ups about their demands, but to no avail. Police and Rangers reached the spot to maintain law and order.